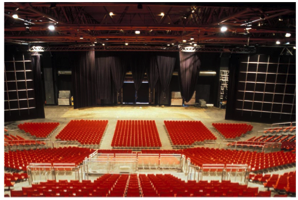 Hi Touch / Lo Touch: When? How? Why? When one answers at the phone “We are currently extremely busy, just send us a memo and we will reply to you”, is this a “hi touch” relationship? A CEO who gives a speech in front of 2 000 collaborators, is this a “hi touch” relationship? When people reciprocally insult themselves on a virtual forum or blog, is this really a “lo touch” relationship? Bullying between teens on Facebook, is this a “lo touch” relationship? 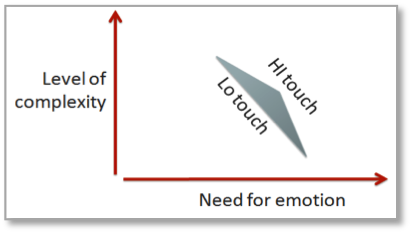 The concept of hi touch / lo touch cannot be reduced to Real / Virtual, it is more subtle as it manages drivers such as emotion, complexity, trust, and productivity. When a relationship needs trust and emotions, or requires the understanding of highly complex matters, or is potentially leading to conflicting situations, then it must be managed in a “Real” environment. 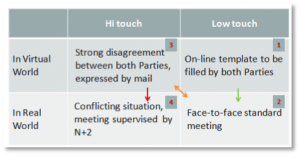 When tasks are not complex, or could be done on a repetitive basis, require very few emotional interactions, or when trust between Parties has already been established, then a “Virtual” environment helps to improve productivity and efficiency. As an illustration, this chart shows how to manage the annual assessment and bonus negotiation of a collaborator, depending on its specificities. 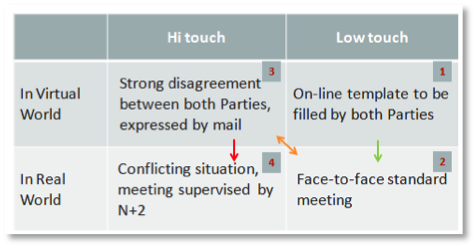 From virtual lo touch to real hi touch, each situation corresponds to a different environment: an assessment without conflicting issues can efficiently be managed through a lo touch process (on-line template to be filled by both Parties, who might also briefly exchange on a face-to-face basis). On the contrary, if both Parties strongly disagree on the assessment, then the process can be resolved only in a “Real World”, face-to-face interaction is necessary to manage the high emotional factor. Apple who regards hi touch (the Apple stores) as a capital expenditure aimed at providing ROI through its lo touch products (the download of Apps). One can also imagine blended models, such as “virtual” meetings between “clusters” where people gather in a “real” meeting room (most appropriate model for remote relationships between communities in a multinational company).